You can help butterflies by participating in butterfly counts all over the world! See the links below. In a unique partnership, you can join citizen scientists across North America to track the monarch butterfly's migration from Mexico. In the spring and again in the fall, volunteers are asked to record their first sighting of an adult monarch, monarch egg and monarch caterpillar. Volunteers collect long-term data on larval monarch populations and milkweed habitat. You are asked to define a site where milkweed inhabits and visit it regularly to monitor activity. 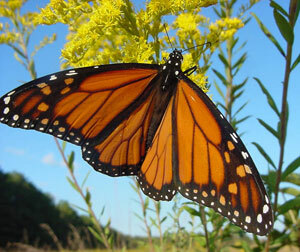 The purpose of the North American Butterfly Association's butterfly counts are to monitor butterfly populations, give butterfliers a chance to socialize and have fun, and raise public awareness by hosting events that will increase general interest in butterflies.Counts are needed in the United States, Canada and parts of Mexico. The VanessaÂ Migration Project is an opportunity for you to share your observations ofÂ VanessaÂ butterflies in order to find out how these butterflies migrate and distribute themselves across North America each year. With your help, we will be able to track the movements and seasonal changes in distribution of these butterflies. We will add your data to an interactive map that shows how the range of Red Admirals and Painted Ladies expands northward in the spring and retreats southward in the fall. We are also mapping the date, location and flight direction of migrations of these butterflies. This is a yearly effort of volunteer citizen monitors to collect data on the status of monarch populations overwintering along the California coast. We are most interested in counts of monarch groves conducted during the week around Thanksgiving and the week around New Years day. The Illinois Butterfly Monitoring Network engages citizen scientists in the process of collecting quantitative data on butterfly populations. The goal is to provide data collected with a standardized protocol that allows land managers to evaluate long-term trends in a changing landscape. Counts are needed in June, July and August. Join fellow butterfly enthusiasts for the annual butterfly count each July. Peninsula Point Monitoring Project is an effort managed by the U.S. Forest Service to monitor monarch larvae and conduct migration counts at an important stopover site on the northern shore of Lake Michigan, Peninsula Point. Larval monitoring begins in May continuing through September and consists of counting the milkweed plants then checking each plant for the presence of eggs and larva, recording the numbers of each. Migration census is conducted daily starting in early August through September. This consists of counting the number of monarchs three times a day. Tagging is also conducted during this time when large numbers of monarchs are present. Volunteers are asked to create a route to be monitored weekly from April through October. This is open to all skill levels. This group has an annual butterfly count in June for the Occoquan Bay area and also weekly counts in the area from April through October. This count is organized by the Toronto Entomologists' Association, where all skill levels are welcome. On some of the counts refreshments or camping facilities may be provided. Counts typically occur from May through August. Over 40,000 volunteer records participate in Butterfly Conservation's butterfly and moth monitoring program. Anyone can take part, from butterfly beginners to experienced recorders. Butterflies are extremely valuable indicators of the state of the environment. The ongoing recording and monitoring programmes help direct conservation effort where it is needed. It also helps with the assessment current conservation work.